When it comes to fashion, a lot of us can be stuck in a rut and not even know it! We may wear the same old maxi dress we used to wear 6 years ago because it's that one dress that used to make us feel good every time we put it on. But here's thing: what used to look good years ago may not look so good now, better still, as a women, I'm sure you can appreciate that our bodies are ever changing and even though we may prefer to wear that same old maxi dress, our bodies may prefer something else. Which is why, for me, the proverbial shaking up of things when it comes to my summer fashion is in order. And here's what should be on your summer fashion bucket list this SS18. The first order of business is to try mules! They are this summer's staple sandal , and rightly so! They slip on or off so easily and the right ones can look so so chic, like these black & neutral mules with pom-pom detailing. These will be great for looking on those super hot summer days. I think we can all agree that gone are the days of tight-fitting skimpy dresses because SS18 fashion is proving to be about billowing carefreeness and nonchalance - cleverly epitomized by beautiful flowy dresses. And this white shirt-dress midi with topstich from Zara is high up on my radar! To say that I love it would be an understatement! Oh florals! This is the one trend that I haven't embraced at All! I mean, don't get me wrong, I used to wear florals as a little girl (I think), but never as a grown woman. I've always veered away from it probably because i never new how to style anything floral. But no more! The plan this SS18 is to embrace this trend which doesn't seem to be going away anytime soon might I add! 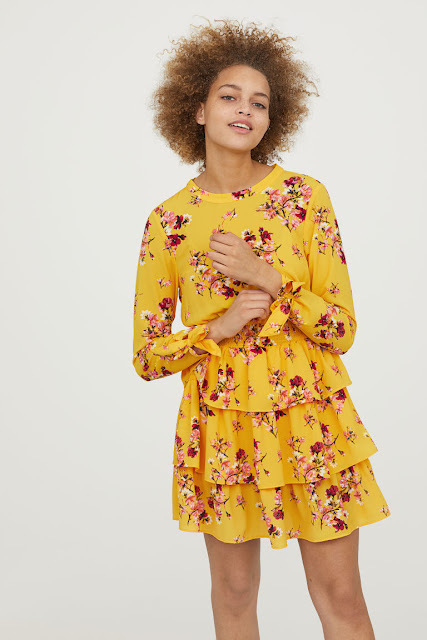 So I'm thinking this yellow floral day dress might be the perfect way to dip my toes into the floral trend, plus the colour is fab! Yes, chinos! To be honest these have been on my radar for quite some time but I always disregarded them in favour of skinny jeans because jeans just seemed easier to style. But I'm determined to add chinos to my summer wardrobe because I know they'll be great to wear for those not-so-sunny days. I can pair them with a pair of converse (obviously) and a striped tshirt for more of a nautical vibe! And these neutral chinos from nextdirect are just what I need. Look, I love my bikinis - I really do. But there's something easy about a one piece that just makes the whole notion of spending your day poolside that much more effortless. Plus it offers a bit more courage - and lord knows there'll be days when i actually really need it! So I'm thinking this scalloped black full body swimwear with white polka dots is the way to go! To say that tassels are in vogue would be an understatement! And unfortunately for me, I'm rather late to the (tassel) party! 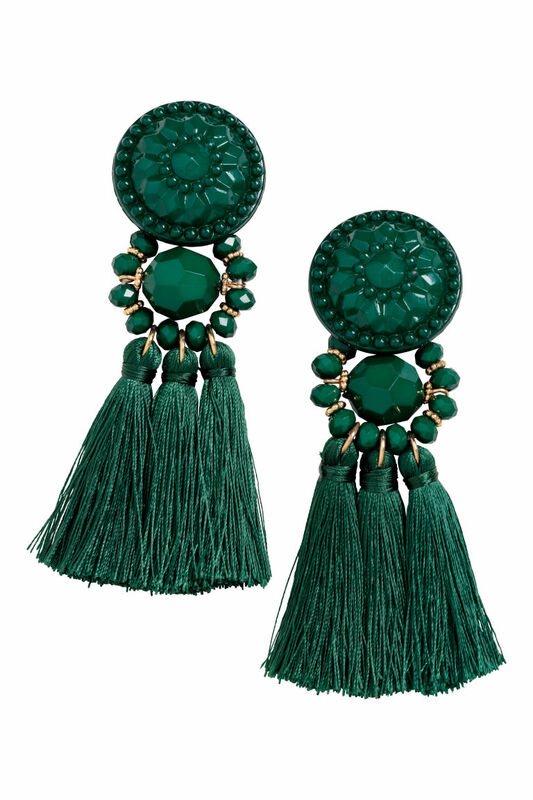 But nonetheless, I'm determined to rock, or at the very least, try out this trend and these emerald green tassel earrings from H&M have definitely caught my eye for sure! They're full of drama and possess, which is what I love about them! FOR MORE FASHION TIPS, HEAD OVER HERE!